There's a sticky thread that says 1PasswordX shows a "blank page" in Firefox private browsing mode with certain settings. Assuming "blank page" means the popup is a white square, I'm experiencing that as well. The "Content blocking" settings are set to the default that the browser ships with: "Standard - Only blocks known trackers in Private Windows"
I think it's worth noting that the extension still works (the 1P icon appears in text boxes and I can still fill forms from there, but the popup won't show). Let me know if you need any more info to diagnose this issue. I'd love to get it resolved soon; it's become a hassle to log into various hub-type websites, lol. So just to make sure I'm following correctly, the inline menu will display, show the correct matches and allow you to fill but clicking the 1Password X button in the Firefox toolbar garners zero response. This is what I see if I try to access 1Password X whilst in a private window and is what I believe we're referring to in that thread. Is the issue happening everywhere or do you see it occur with certain sites? I'm just wondering if there is something we can do to try and reproduce whatever you're experiencing as it isn't something I've come across yet (I think anyway). Hi, your screenshot shows what I'm experiencing here. So technically not "garners zero response" but rather the popup is just a white square like I said. It happens on every site as far as I know. Let me know if you need more info from me! Firefox doesn't support the extension.getBackgroundPage() API we use in Private Browsing mode. It looks unlikely that Mozilla will change this restriction (which isn't an issue in Chrome), so we will have to work around it on our end.¸We have an issue filed for this, I don't see us getting to it any time soon, as it would require fundamental changes to how things work. Is 1Password X working in a normal, non-private window? @marshall_stacks Well, all software has areas that could improve. Good thing is there are usually plenty of options, and we're able to use what we like best. Hi all! 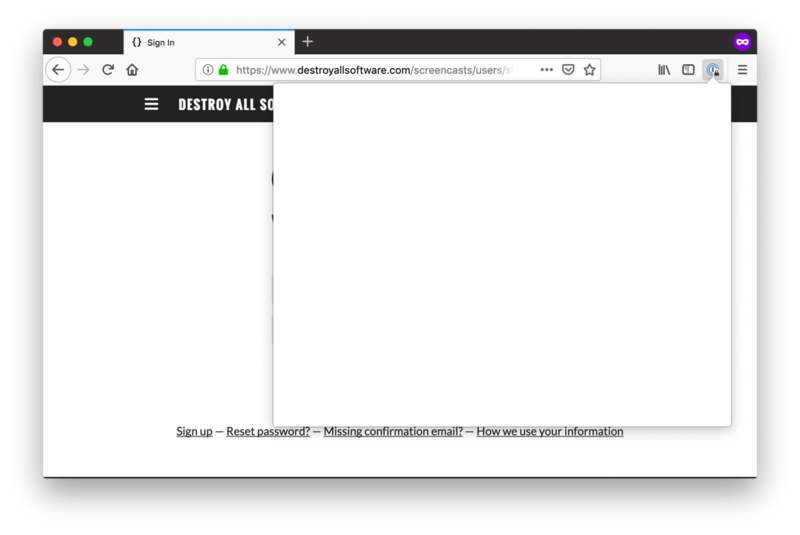 I had the problem with a 'blank window' appearing when I clicked on the 1Password extension in Firefox in Private Browsing quite a while ago and it drove me crazy trying to figure it out. I realized that I can't live without that 1PW extension!!! I remember spending hours looking thru the Support Forum threads and trying all of the solutions with no relief. Finally I found a reply to another poster from a 1Password Team member that was so simple and worked. Yay! .... Until a few days ago when it happened again, and life sucked once again. I could NOT remember what I had done last time and proceeded to waste a ton of time trying the various possible solutions. Today I found an old post of mine from long ago thanking a Team Member for his suggestion. Feeling pretty dumb, but so glad that this worked for me. Again! Adding the extension from my browser (Firefox Quantum 65.0.2 (64-bit)) did not work. Must use the 1PW download on their site. So happy that the solution was simple and hoping this will work for others having the 'blank window problem' as well! I'm seeing more than one separate issue being reported in the thread you linked to and reinstalling the extension shouldn't impact the blank window in private mode as that issue is one at the API level. My suspicion is you're experiencing a separate issue. I am having a similar issue except when I click the icon I get a blank tab that opens and that is it. Not in private browsing or anything like that. All default normal settings in Firefox. 1. Sign out and sign back into your account on 1Password.com.